Since EWG launched its annual sunscreen guide and its efforts to get industry and the Food and Drug Administration to make, market and regulate safer, more effective products, there have been significant improvements on behalf of consumers — and a few areas where more still needs to be done. Since 2007, when EWG published its first Sunscreen Guide, many sun protection products sold in the US have become safer and federal regulators have cracked down on some of the worst phony marketing claims. But our investigation of approximately 650 beach and sport sunscreens for our 12thannual guide found that serious concerns remain. Two-thirds of the products we examined offer inferior sun protection or contain worrisome ingredients like oxybenzone, a hormone disruptor, or retinyl palmitate, a form of vitamin A that may harm skin. And despite scant evidence, the government still allows most sunscreens to claim they help prevent skin cancer. Over the course of 12 years, EWG has uncovered mounting evidence that one common sunscreen chemical, oxybenzone, poses a hazard to human health and the environment. It is an allergen and a hormone disruptor that soaks through skin and is measured in the body of nearly every American. In laboratory experiments, oxybenzone caused damage and deformation of coral by acting as an endocrine disruptor and damaging the DNA of coral larvae. Oxybenzone has also been shown to cause coral bleaching and even coral death. Legislators in Hawaii recently passed a bill, not yet signed into law by the governor, to ban the sale of oxybenzone-containing sunscreen due to its effects on marine life. Outdoor supplies retailer REI also vows to ban the use of oxybenzone in products sold in its co-ops by fall 2020. Despite these actions, oxybenzone is still used widely on the market. The ingredient is in two-thirds of non-mineral sunscreens we assessed. 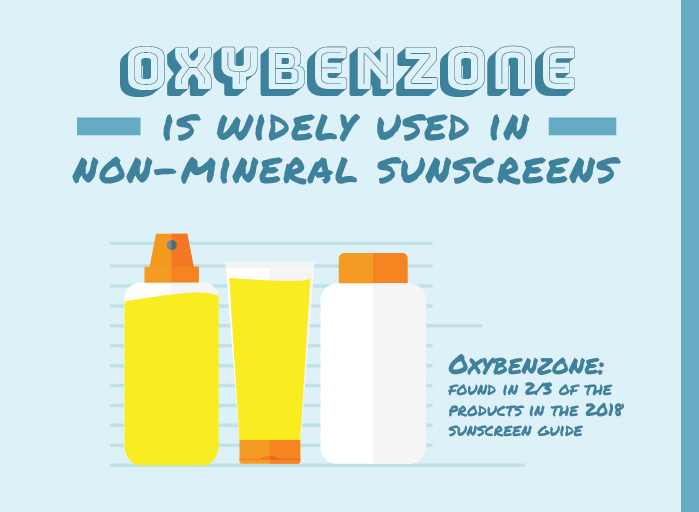 Mainstream sunscreen brands include oxybenzone in most of their products, including those marketed to children. For people who want to avoid oxybenzone, this year’s guide identifies 211 top-rated mineral sunscreens and 23 non-mineral products that don’t use it. We’re making a renewed push to shift the market away from oxybenzone. Join us in demanding companies go oxybenzone-free by 2020. Since 2007, we have found a dramatic increase in the availability of mineral-only sunscreens, more than doubling from 17 percent of products to 41 percent in 2018. Sunscreens using zinc oxide and titanium dioxide tend to rate well in our analysis. They are stable in sunlight, offer a good balance between protection from the two types of ultraviolet radiation – UVA and UVB – and don’t often contain potentially harmful additives. When we began this work in 2007, there were no legal requirements that sunscreens shield against lower-energy UVA rays. In 2011, the Food and Drug Administration enacted the first rules that required sunscreens advertising “broad spectrum” to pass a test, and nearly all sunscreens sold today include an ingredient that filters UVA rays. However, the FDA set the bar too low and most products pass the agency’s test without offering adequate UVA protection. We remain concerned that a common sunscreen additive, a form of vitamin A called retinyl palmitate, can harm skin. Government test data shows more skin tumors and lesions on animals treated with this ingredient and exposed to sunlight. In 2010, when EWG first voiced concerns about retinyl palmitate, nearly 40 percent of the products we reviewed contained vitamin A. Since then, the use of this troubling ingredient has dropped by more than half, and of the products we surveyed for this year’s guide, it was in only about one in eight. Consumer Reports: Do Americans Take Too Many Prescription Medications? Rushed Into Taking Medications Too Quickly?